Whether you're visiting the area or lived here all your life, we want your experience at Journey to be a great one! We know visiting a church for the first time can be intimidating and that you may have some questions. Here is some information that should help. We have two services, one at 8:30 AM & one at 10:30 AM. Each service runs about an hour and 15 minutes. We offer Kids Church during the service. Kids stay in the main service with you until right before the message begins when they are dismissed all together. Our Kids Church is open to Pre-K through 6th grade, and we have nursery available for infants to 2 year olds. For more information about our Kids Church check out our Journey Kids page. You can wear whatever you feel comfortable in at Journey. Look around and you'll see everything from jeans and t-shirts to dresses and full suits! Our only requirement is . . . clothes! When you arrive you'll be greeted, offered some coffee, a bulletin and help finding a seat. If you have children you'll be directed to our Check-in Desk where you'll register and sign your children into our Kids Church. First of all, casual and friendly! We have a full band, we'll start with some music led by our worship team and we have words to each song on a screen so you can sing as much or as little as you want. After that we'll jump right into the message. Each message is around 30-35 minutes long and is used to take Biblical principles and work to apply them to your life in real ways. How do I get to Journey? Our new location is 15 Hutchins Drive in Conway. 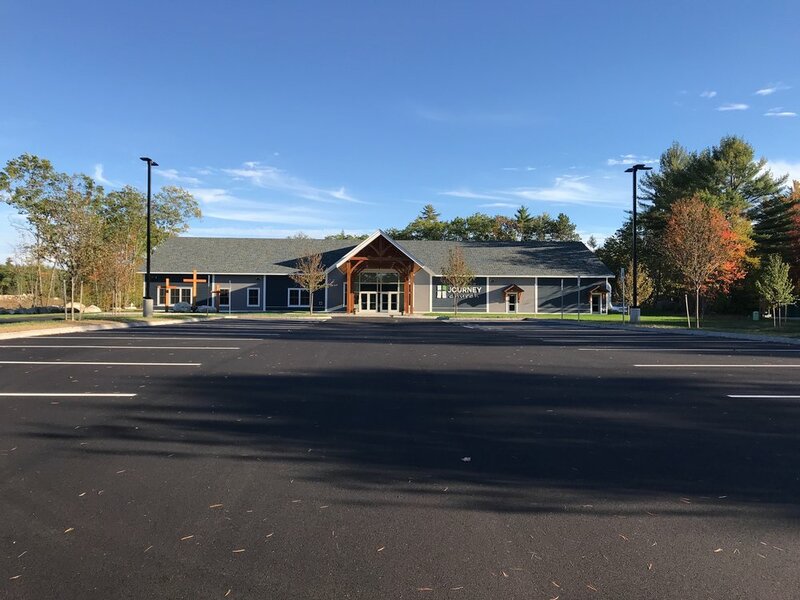 Head east on 113 toward Center Conway, we are on the south side of the road right after Saco Woods Condominiums, before you get to the stop light. Look for the sign near the road with our name on it.